A red-lipped batfish waddles across the sea floor on its fins, searching for small sea creatures to eat. Other animals may fly or glide, or jet-propel themselves to get around. These creatures come equipped with legs, wings, or tentacles, and they often move from place to place in surprising ways. In the latest eye-catching escape into the kingdom of Animalia, Caldecott Honor-winning team Jenkins and Page show how animals roll, fly, walk, leap, climb, swim and even flip! This fascinating and fun illustrated nonfiction melds science, art, biology, and the environment together in a detailed and well-researched book about how animals move in our world today. 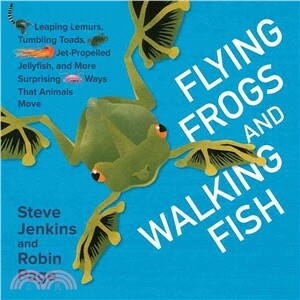 Steve Jenkins?and?Robin Page,?creators of the Caldecott Honor book?What Do You Do with a Tail Like This? ?and many more popular titles, live in Boulder, Colorado. Visit their website at www.stevejenkinsbooks.com.